Chris Slingsby, chairman of Bridlington Talking Newspaper, receives a cheque from Jane Baker of Bridlington Folk Club. Rear left is Rob Pagett of the folk club and rear right is Chris Shilladay of the Talking Newspaper. There was a good attendance on a foul night for the club’s annual charity night, which this year was in aid of the Bridlington Talking Newspaper. These included singers, musicians and a poetry reader – thanks to all of them for contributing to an enjoyable evening. Following the presentation of a cheque for £100 the chairman of the Talking Newspaper, Chris Slingsby, gave a brief but interesting talk on the work of the organisation and the equipment required, after which the music continued. It was nice to see some old friends at the club again and I hope it won’t be too long before they make a return visit. 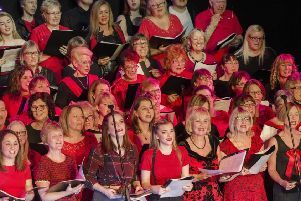 The next club night is on Tuesday 20 June which is a singers and musicians night, with the next guest night being on Tuesday 4 July , featuring Scolds Bridle, a long-established female duo from Lancashire.